Jews in Gotham: New York Jews in a Changing City, 1920-2010. 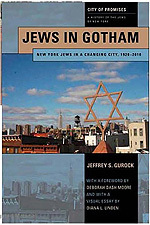 Jews in Gotham: New York Jews in a Changing City, 1920-2010, by Jeffrey S. Gurock (Vol. 3 of: City of Promises : a History of the Jews of New York). NYU Press, 2012.